All you need is love (and a few simple ingredients) to make these fun treats for all your Valentines. From sweet and simple whoopie pies and Cupid-worthy cookies to easy Valentine cupcakes and healthy snacks, we have something that will help you make those special people feel extra loved. These heart-y whoopie pies go together like you and your Valentine and are a piece of cake to make! Made with a boxed cake mix, this easy whoopie pie recipe is piped into heart shapes, making it pitter-patter perfect for sharing with your sweeties. 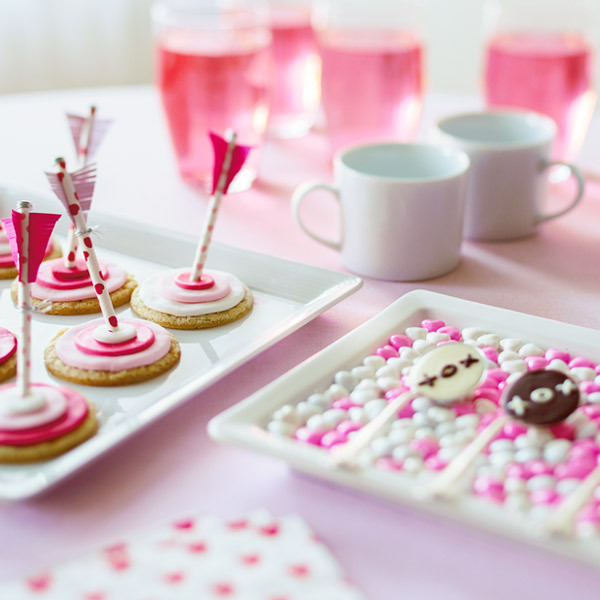 Need an easy Valentine’s Day party treat? We’ve got you covered with this sweet and simple Valentine snack mix. This heart-y treat can be served by the bowlful—or packaged individually for a sweet classroom treat. Make ’em swoon with these simple chocolate-dipped spoons made for stirring in some sweetness. Milk chocolate and white chocolate chips are melted and then scooped into spoons to create perfect portions of chocolate-coated bliss made for swirling in coffee or hot cocoa. Looking for a no-bake Valentine’s Day treat? These cookies hit the mark! Store-bought sugar cookies get party-ready with fondant and paper Cupid’s arrow toppers. This trio of Valentine’s Day cupcakes will give you heart-eyes. They’re adorable, easy to make, and don’t require super-fancy materials (or skills). Bake up some for your favorite kiddos, or pick one up at a bakery and package it for your sweetie. Cupid hits his mark in this fabulous Valentine's Day cupcake complete with an arrow made from a wooden skewer and gummy candies. Start with a bakery-bought cupcake or make your own. Present the object of your affection with…an object of your affection. A jar is the perfect container for a cupcake dressed in its Valentine’s Day best (not to mention a safe way to deliver your message). Baking cupcakes in ice cream cones and decorating them like sundaes gives them a retro diner twist. And it gives you an excuse to add a unique, creative touch to each one. Need something other than candy and chocolate for a healthy Valentine’s Day treat? Look no further than these darling snacks. Give your little lovebugs something to smile about—an adorable, bite-size treat. This cute stuffed celery appetizer is a fun—and stealthily healthy—alternative to sweet Valentine’s Day party treats that kids are sure to love. Wash down all these lovely treats with a festive Valentine’s Day drink. Toast your Valentine with the world’s easiest—and cutest—soft drink! Just cut strawberries in half, and then cut a V-shaped notch in the top of each half to create a heart shape. Place one strawberry heart in each well of an ice-cube tray, add clear soda until the strawberries are covered, and freeze. They’re perfect for adding a splash of fizzy fun to any drink or party punch bowl.